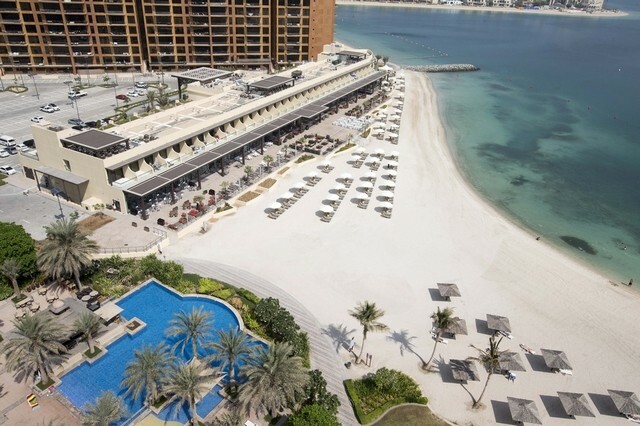 Nakheel has opened a new beachfront strip of restaurants on Palm Jumeirah as part of its Dh20 billion push into retail and hospitality. The Dh120 million Club Vista Mare located at the end of the island’s main trunk features seven new restaurants all located directly on the beach. Cuisine on offer includes Italian, Middle Eastern, European, American Nikkei (Peruvian-Japanese) and Ethiopian, the developer said in a statement. The developer of Dubai’s palm-shaped islands has been investing heavily in its retail and hospitality units as it seeks to boost recurring revenues and rely less on residential property sales. It is also developing other retail and dining destinations on the island including Nakheel Mall, The Pointe and the Golden Mile which is already open. “We have delivered an exceptional new venue that offers a diverse collection of dining options in a stunning setting,” said Nakheel chairman Ali Rashid Lootah. Located between the Shoreline Apartments and Tiara Residences on the eastern side of the island, Club Vista Mare covers 50,000 square feet and can seat 2,000 guests.